Technology has moved on so fast in recent years, it was only natural that it would be adopted by healthcare at some point. We already wear watches that monitor our health and fitness, so virtual doctor appointments are perhaps not such a surprise! Almost every activity that was done in ‘real-time’ is slowly being replaced by virtual technology! Booking a holiday, visiting your bank, not to mention the huge online shopping boom! In case you’re not aware of what Virtual healthcare is, let’s give you a quick answer, then we can go on to a bit more detail. Virtual Healthcare is a method by which medical professionals and health care providers such as Doctors, Nurses and medical assistants, seek to consult with their patients, ascertain a diagnosis and offer advice without physically being present. This method of healthcare is sometimes also called ‘Telehealth’ or ‘Telemedicine’. But why is this a need for us? The system surely worked well enough before this technique came along – didn’t it? With people more time-strapped than ever, we now rely on time-saving online activity. How many times have you needed to seek advice from a doctor but have been unable to take time off from your work, or had your boss wagging his finger at you asking if it’s important! Waiting in a line in a busy doctors office at 8:30am on a Monday morning, worried about missing time from your daily work routine can simply add more stress to any medical condition you may be trying to correct. Getting dressed and hitting rush-hour when you’re not feeling your best can feel like a mountain to climb. So let’s take a look at how virtual Healthcare can assist you in terms of managing your time around areas like your day-to-day health, as well as organizing your prescriptions. For many of us, it’s a constant battle trying to reach a work/life balance and more often than not, routine, or even more important visits to a doctor’s office or a medical institute will be overlooked, or perhaps may even need to be canceled at short notice. This puts even more pressure on the medical professional in terms of their time and costs. Virtual Healthcare refers to ‘virtual visits’ that take place between medical professionals and the patients, via a whole range of technology. Often conducted by cell phone or tablet, these enable contact between the two parties from virtually any location. So, a virtual visit can be described as a video conference or audio call between a healthcare professional and a patient at their home. Virtual Healthcare is used primarily for meetings, consultations, check-ins, reports, and prescription organization – rather than for in-depth diagnosis. Virtual Healthcare is also a perfect platform for consumers to find qualified second opinions online. The concept of virtual care is to provide a more streamlined, efficient and personally attuned level of health care that was previously unavailable, and the purpose is to deliver a higher quality and more convenient level of care than previously obtained. Will Virtual Healthcare Replace Traditional Consultation? So, now that we know what Virtual healthcare is, you might be wondering if virtual healthcare will ultimately replace traditional methods of healthcare, such as visiting medical institutions, hospitals and Doctors offices. Let’s take a look at why we think virtual Healthcare is a way in which we can combine existing ‘live’ care with the more efficient and time-saving virtual options. Although Virtual Healthcare is rapidly improving the way in which we can access and receive care, it’s unlikely it will ever completely replace more traditional consulting methods. Although of course, digital technology continues to evolve and improve our lives, virtual Healthcare should be seen as an improvement to our healthcare solutions, one that works alongside and complements traditional methods of care. Why Should We Consider Virtual Healthcare? The Deloitte Centre for Health Solutions has conducted a ten-year survey to identify consumer experience trends within the healthcare system. Findings from the survey indicated that 77% of consumers have never tried a virtual visit, but over half (57%) of people who undertook the survey said they’d be willing to try. Millennials, more than any other of the age groups surveyed, said they’d be willing to try. 77% of consumers surveyed who had tried a virtual visit expressed a high degree of satisfaction with the experience. Interestingly, consumers with chronic conditions which affected their everyday life were among those with the highest levels of satisfaction. This clearly shows an upward trend in those who would be willing to try the convenience of a virtual health appointment and many who have found it to be a suitable alternative. It appears from this survey that virtual appointments are going to be an increasingly more prevalent option for consumers in the future and something you should perhaps try. Telehealth and Virtual Healthcare are often used interchangeably to describe technology-driven healthcare. But in fact, the latter is a component of Telehealth which has a far broader spectrum, covering any and all elements of electronic and telecommunication services required to provide remote health care at a distance. 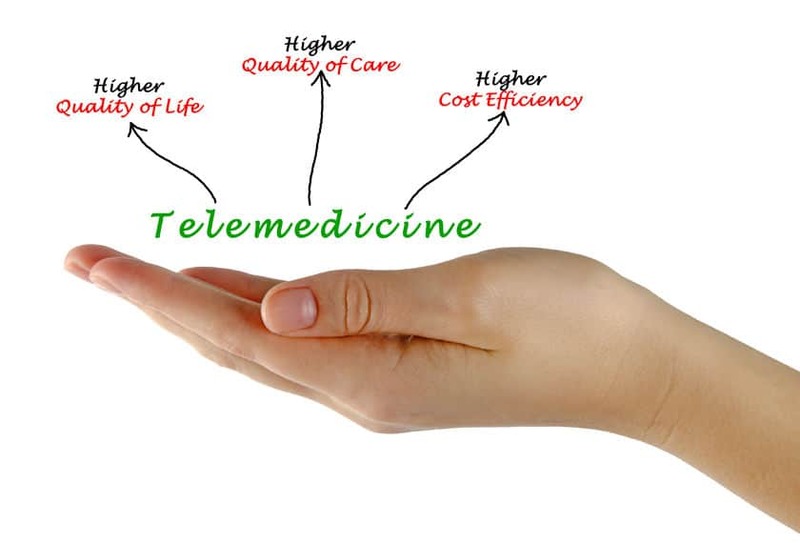 So, Telehealth encompasses many different types of technology, chiefly used to gather and exchange information. Telehealth has been around for nearly a decade, but given the increase in the use of smartphones, laptops and other smart devices – so easily at our fingertips, it seems that this will be the way forward for many of us. The purpose of Virtual consultations is to provide a more cost-effective and cheaper alternative to the usual surgery or office appointment. On average a telehealth visit would cost around $79, rather than $149 for an office appointment, which is a considerable saving. Virtual Healthcare options also make the most of a ready trained workforce of physicians and doctors, rather than the expense of recruiting and training others. ‘Virtual health technologies can augment human activity, expand clinical capacity and improve efficiency by ushering in a new health care model, where machines and patients join doctors in the care delivery team’. It looks as if taking on board a technological approach to our healthcare has benefits for both providers and us as consumers. A virtual appointment is a case of linking our technology with that of our healthcare providers! Sounds pretty simple, right? Most virtual doctors appointments will require you to register an account to provide them with the information required to make the connection. This could be in the form of an app you can download onto your smart-phone. When scheduling an appointment you are asked to sign in, or if you’re a new patient, you’ll be asked to create a profile. At this point, you can set up your options for payment and add in your Health Insurance details. You will then have complete control over your own schedule and requirements and can usually book a ‘same day’ appointment or plan further in advance. During your appointment time, you will receive a call-back from your doctor. As soon as you connect you are in your allotted appointment time. Once connected you can now speak freely to your doctor about any concerns you have. Doctors sometimes have the option to link you to their video chat, which is perfect for explaining to your doctor about any physical symptoms you have. Most consultations last around 15 minutes. At the end of the consultation, the doctor will make a diagnosis and a personalized treatment plan and discuss any medications that may require a prescription. There are greater benefits in this method for everyone, including the patient, better than worrying about taking time off work and getting through the usual commute with the rest of the world when you’re perhaps not feeling your best. The system is perfectly dove-tailed so your doctor can prescribe and send electronically any medicines you require to be sent to a pharmacy nearby in your area. These can usually be picked up as and when you’re able, at your convenience. Doctors can generally prescribe up to 90 days of any FDA approved medications, which include birth control refills, antibiotics, and other medications. Not all states offer this service. Some do not offer remote prescriptions, but the laws in each state are constantly evolving and changing. So do make sure you keep up to date in your own location. The world of Virtual Health is catching up with us as consumers and provides a great addition to our health services as we know it. It provides freedom to have consultations from literally any location. The facility for prescriptions to be sent and arrive electronically – direct to a convenient pharmacy, and the peace of mind that you’re able to take advice and see your doctor without the usual difficulties of booking time off work, or trying to convince your boss that your health is more important than a day at the office! Why not ask your local health providers about trying the service out for yourself? And, as always, we are here to help with your medications. A simple call is all it takes to be in contact with one of our qualified staff members – so give us a call now, you never know, one day it could even be a video call.